Soe Than, prepping puri for breakfast at Shwe Ya Minn.
As England is to pubs, Myanmar (Burma) is to tea shops. You'll find them everywhere, sometimes lined up one after another, with their little plastic stools and small tables spilling out onto the sidewalks and into the streets. Burmese tea, a potent combination of strong black tea leaves mixed with evaporated and condensed milk, is an acquired but delicious taste. Although open all day, often from 6am until 10pm, the busiest times are early in the morning for breakfast, and in the evenings when they move an LCD TV from inside and onto a wall outside. In the early morning and later in the evening, there can be more than a dozen tables around, and in between, it'll shrink to half of that. The shop is owned by Hla Shwe and his family and they have been in business for 3 years. Thirty-nine year old Hla Shwe manages the shop, while his father, Melit, handles the money from behind a makeshift counter. A staff of kids on summer vacation run around taking care of the rest. Stickers from the NLD party in Myanmar (Burma). Something that you likely wouldn't see even a few years ago. 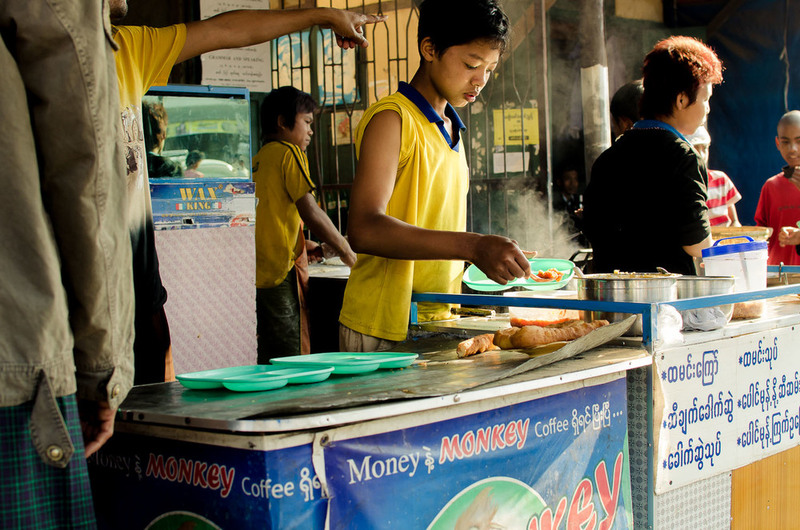 For a typical Burma breakfast, you'll often see them frying an assortment of sweet pastries like naan with sugar, puri, samosa, and char kway. You'll have to get there early though, as they stop frying by 8am, and after that you'll be out of luck besides the left over samosa and cha quay they keep in a case. When you sit down, you can help yourself to weak Burmese tea (free). If you don't find a thermos of tea on the table, you can be sure that one will be brought to you shortly. People often pour a small amount into the cups provided, swish it around to wash, then toss the liquid onto the street. You may also want to wipe it down with a piece of tissue as well, which you'll find in a plastic container, rolled up like toilet paper. Not far behind that, there will be samosa and char kway delivered to your table. The samosas are typically made with vegetable or potato inside and cost 100k (~$0.10). Char kway, also only 100k, are U-shaped fried dough that are often dipped into the tea served with condensed milk (laphet-yeh). Whether you choose to eat them of not, they'll be brought to our table. You just pay for what you eat when you leave. Puri is my breakfast of choice at Shwe Ya Minn. Three puri bread with a side of potato curry and a side of spicy tomato purry will set you back 300 kyat (~$0.35). Tissue rolls for cleanup, and you might need them after eating a greasy pastry or two. My favorite breakfast is puri. It's a light, fried bread that puffs up to look like a soft UFO. It comes served with both a side of potato curry and a side of tomato puree mixed with chilly to enjoy with. It's one of those things that when it's good, it's great... and at Shwe Ya Minn, it's great. 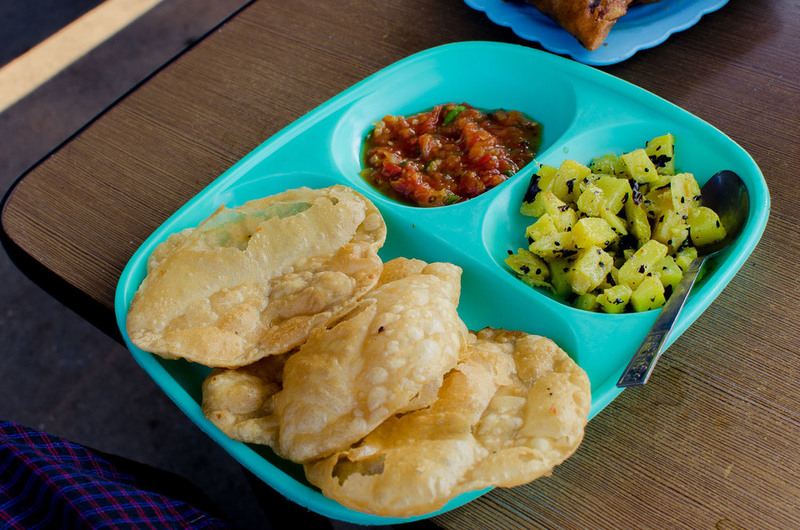 A plate including three puri will cost you a cool 300 kyat (~$0.35), making it a fantastic deal. After 8am when things quiet down, fried noodles, basic rice dishes, and soups can be had for 500kyat to 1000kyat (~$0.50-$1.00). 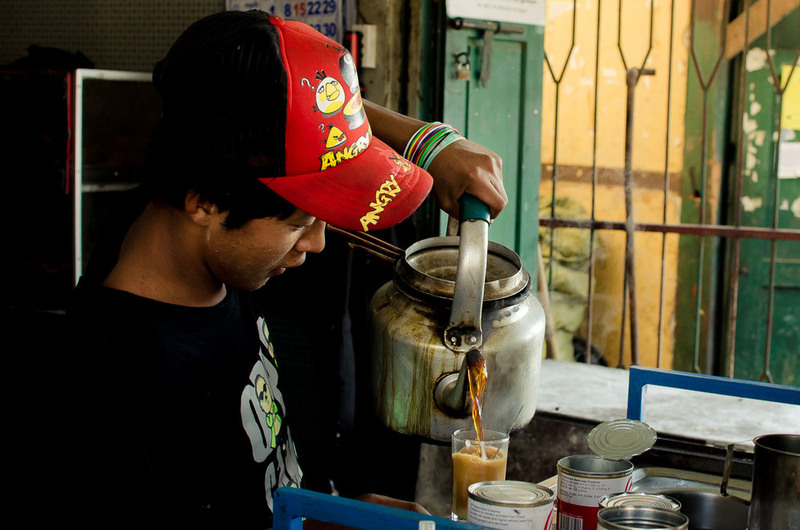 Of course, being a Myanmar tea shop, there will be plenty of tea options for you. The most popular is "laphet-yeh" (200kyat, ~$0.20) which is the tea mixed with condensed milk. Perhaps it's the sweetness that does it, as I know more than a few travelers that can't get enough of this and can't wait to try to make Burmese milk tea at home themselves. Coffee and also "coffee-mix" (brand name packets of milk powder & sugar) are also available to be had. If you're like me and not into coffee or tea, no problem. Bottled water and soft drinks are on hand to quench the thirst and keep dehydration at bay. Down to a science. Tea master Mg Naing churns out glasses of laphet-yeh with fluidity and style. Interestingly enough, single cigarettes are 50kyat each (~$0.05), and communal lighters are attached to poles by rubber bands around the shop. Not my scene, but popular with the locals. To attract attention, you'll often hear a "kissing sound." After all of these months spent in the country, I still haven't been brave enough to add it to my repertoire, but in my experience, the Burmese love it when travelers try it out. If you're feeling bold, go for it! When you're finished, you can break out some Burmese and impress the locals. Doing my best to write these out phonetically, so try them out (and often) until you get them down. 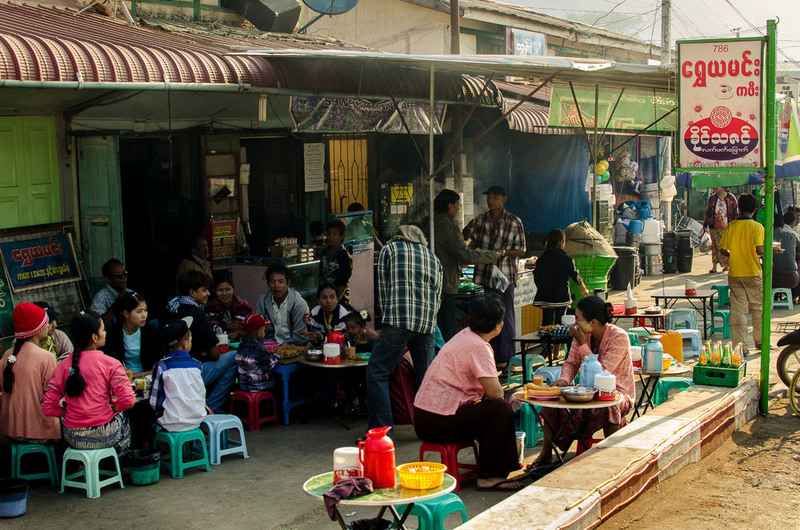 Enjoy your Burmese tea shop experience, wherever in Myanmar it may be! Keeping you fed at Shwe Ya Minn: (R to L) Soe Than, Kyaw Myint Than, Mu Lay Win. If you enjoyed this, you can read more of my articles on Myanmar / Burma, check out more of my photo stories, and my travel tips for Myanmar/Burma.